I normally make the effort to steer away from spoilers, but in some instances, the story is so bad, there’s no avoiding them. And what makes this issue’s story all the more disappointing is how good last issue was. This chapter is presented in three acts. Act 1 is Jimmy Olsen-centric, in which a girl lures him to a rally for the terrorist cult, Kobra. I can understand Jimmy going; he’s young and hormonal and is kept in the dark for much of the journey. And once he realizes the purpose of the rally, he wastes no time snapping photos with his phone, because he’s a news photographer. I know from personal experience: a news photographer regards his camera the same way a soldier regards his weapon. Moments later, the rally is destroyed by a – what? An explosion? A dimensional vortex? A worm hole? What I don’t get is why this girl thought bringing Jimmy to a Kobra rally was a good idea. A.) He’s press. B.) He works for the Daily Planet, a newspaper associated with Superman. She had to have known what Jimmy would think of Kobra. One of two things is happening here: either Lois just told her father Clark and Superman are the same person – which is not her secret to tell, especially to someone who admits to not being trusting, and whom she knows to be less than trustworthy. But judging from the conversation leading up to that moment, he seems to be aware his son-in-law is not entirely human. OR… it was an unnecessary moment where a woman feels compelled to remind her father that she loves her husband. And the father’s reaction to that is to turn and walk away. I don’t get it. As an aside, Lois mentions Jon being out in space with Jor-El, but two weeks ago in Superman #7, he returned, now a few years older. So clearly the continuity between Superman and Action Comics is a little out of sync. Both are written by Brian Michael Bendis, so I don’t know why that is. I just hope it’s fixed somehow, sooner rather than later. Act 3: Superman is flying over the city of Atlanta. Why? Why not? All of sudden, amidst the people calling, “Superman! Superman!” his super-hearing detects a different call, one of panic and danger. Instantly, he discerns a heavy-set African-American woman falling from a building. I don’t know about you, but for me, a heavy-set African-American woman within the DC equals Amanda Waller. If Bendis & Co. were trying to surprise me, they did anything but. Waller tells Superman that whoever pushed her had deep intel in order to get the drop on her. When Superman soars to the top of the building for answers, he finds the same phenomenon that destroyed the Kobra rally. Whatever it is, it passes pretty quickly, and amidst the chaos, Waller disappears. And thus the story ends with the Man of Steel confused. Hmm. I’m confused too. One might think Waller to be a victim here, but I can’t help but feel she somehow set Superman up. As to why, that may or may not be revealed next issue. 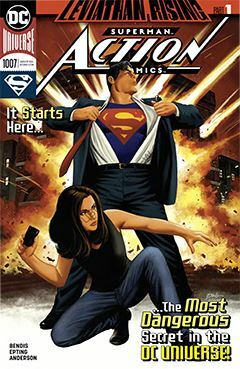 This issue demonstrated Bendis’ inability to convey clear and/or reasonable motivation for his characters, so it may be an entirely skippable chapter in the current story arc.